Before you can connect to DSS as a Denodo data source, you will need a departmental Data Warehouse account; for help, see About IU departmental Data Warehouse accounts. 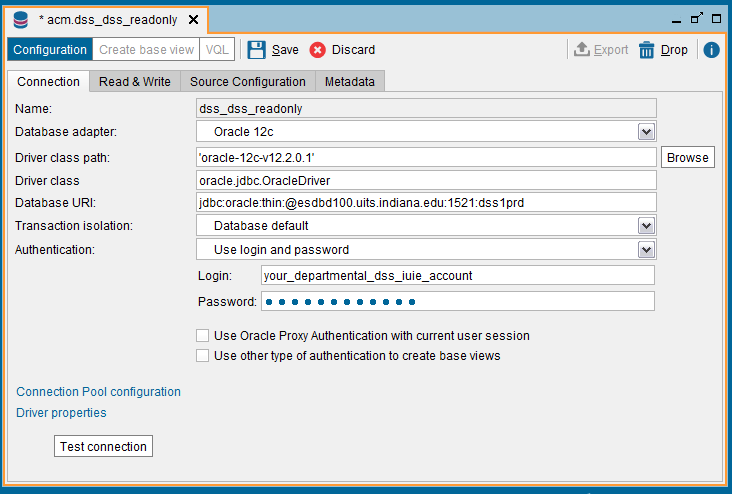 In Denodo, create a new JDBC data source. Name: Choose a unique name, preferably beginning with dss1prd and ending with the account name. Login: Enter your departmental Data Warehouse account name. Password: Enter your departmental Data Warehouse account password. This is document anla in the Knowledge Base. Last modified on 2019-03-04 10:34:57.